Can you believe there's only 4 more days until The Sims™ 4 Vampires* Game Pack is out? Neither can we! We've talked a lot about what's in the pack over the last couple of weeks but we wanted to have a quick re-cap of all the things we've seen you talking about most on social media, so here we go! 1 - Playing the epic Organ! When you're a Vampire living eternally, you need a lot of hobbies. 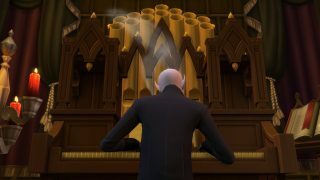 Playing the Organ is a great way for your Sim to idle away their time before sleeping, as the sun comes up and the rest of the town rises. 2 - Creeping around Forgotten Hollow. 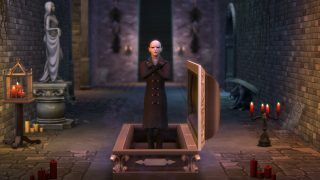 There's a new World in the Vampires Game Pack, and that's Forgotten Hollow. Night time lasts longer here, so your Vampires can thrive better with less risk of bursting in to flames, which is always good. There's a really old feel to this World, with Gothic architecture and fog creeping around, not forgetting the statue of Vlad standing proud in the center. 3 - Gaining ancient Vampire Powers. Powers, you guys. POWERS. 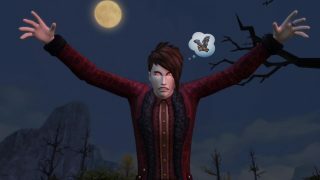 Mutate into a bat, travel through the air as a wisp, become more alluring to other Sims, master mind control, and a whole bunch of others. We're really excited to see what great stories you all come up with using these! 4 - New grungy style decor. We added a few grungy decor options in The Sims 4 City Living, and with The Sims 4 Vampires Game Pack we felt that this was a great opportunity to bring in even more. There's new rips & tears for the walls that fit with the Gothic theme, and some cobwebs to really give the whole place a dusty decrepit feeling. 5 - Sleeping (and woohoo'ing) in coffins! We know how much you guys love your new woohoo locations, so when we created the coffin beds, we had to make sure we added the woohoo option as well. 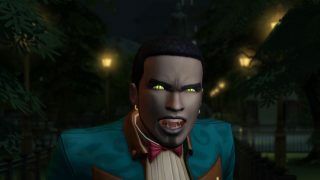 The animation for this is so fun, and we think your Vampire Sims will love it just as much as we do. Also, did we mention there's bat form woohoo? Yup. We couldn't finish up this list without calling out the Vampires themselves! The customization options for the dark form, the fangs, withered glowing eyes, and so much more. We really really really can't wait to see what kind of Vampire you create. So, what are you super mega excited for? Tell us allllll about it on Twitter, Facebook, Tumblr and Instagram using #TS4Vampires!